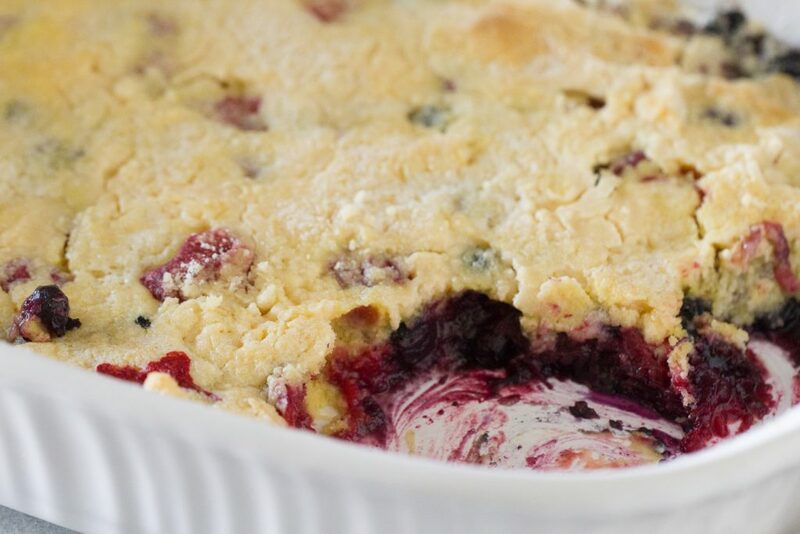 Three ingredients and one pan are all that you need for this Triple Berry Cobbler. Serve it warm with vanilla ice cream on top for the perfect dessert! 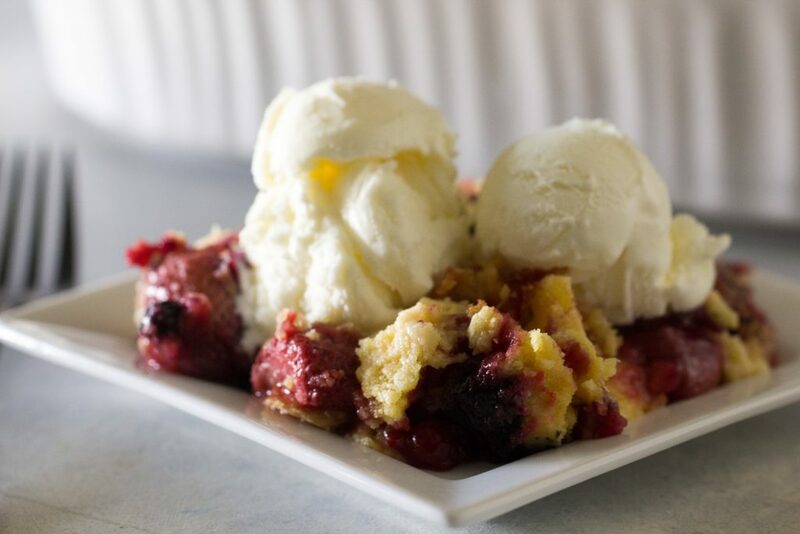 Is there anything better than a warm cobbler with a scoop of melting ice cream on top? I really don’t think there is! With just three quick ingredients, including frozen berries, a cake mix, and butter, you can whip up this delicious dessert in no time. No need to stress over dessert or spend even MORE time in the kitchen than you already do. 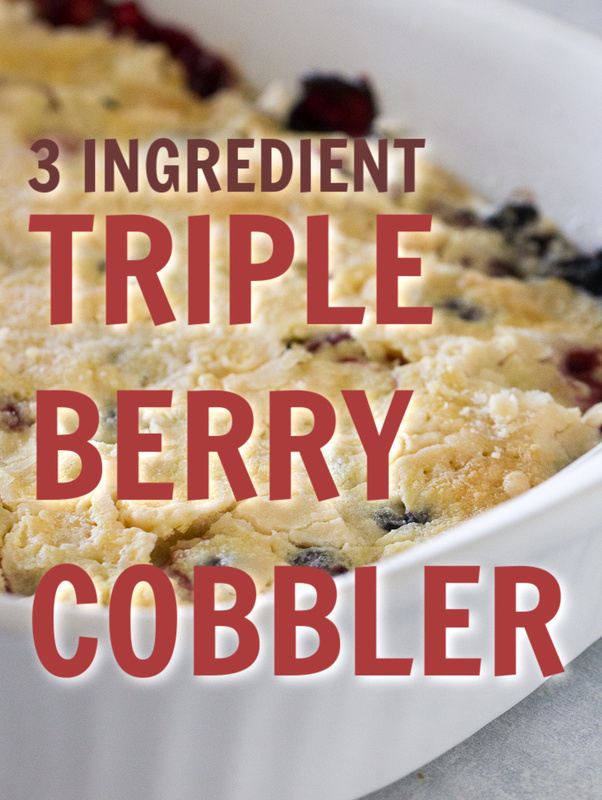 I was hesitant at first about using frozen berries in cobbler. I thought it would need more moisture, maybe more flavor, but boy was I wrong! 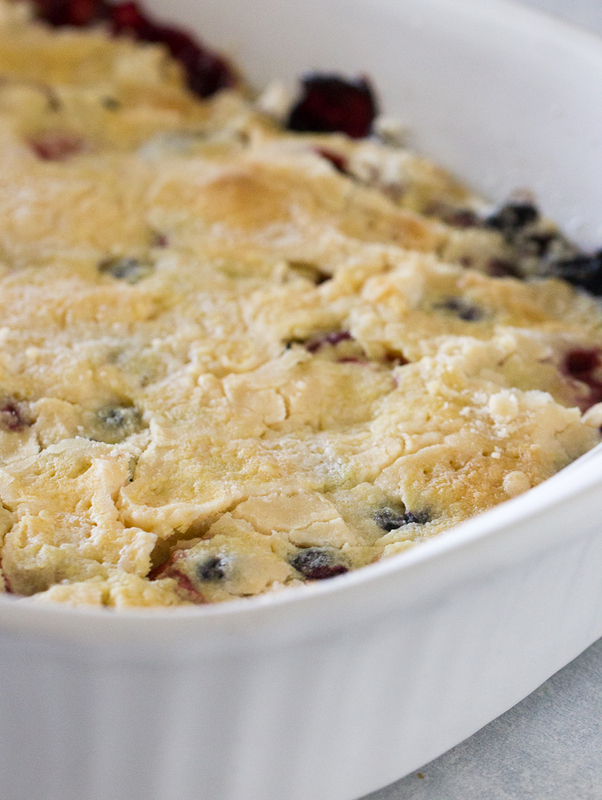 These berries cook up perfectly, releasing their own juices, and baking under the crust to berry cobbler perfection. We used a strawberry, blueberry, and raspberry frozen mix, but any frozen berry mix works great in this recipe. You could also use just one specific kind of berry if you don’t like the mix. My husband LOVES blueberry cobbler! Fresh berries will work great in this recipe too! We’d recommend tossing them in a little bit of lemon juice and sugar before baking to give your cobbler some moisture. Does cobbler intimidate you? I always just assumed creating a perfect cobbler topping was complicated. 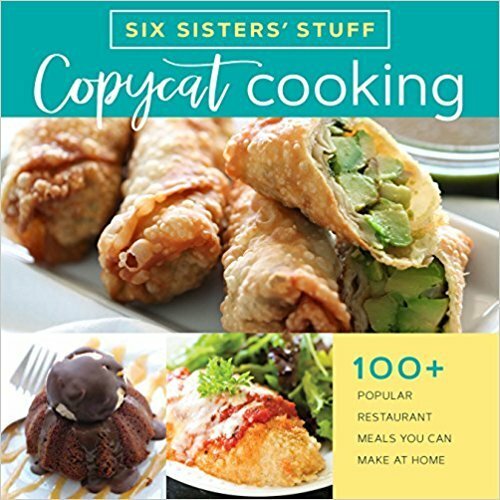 This recipe proved me wrong! Some might consider this kind of cobbler a “dump cake.” We’ve got a delicious recipe for Peach Cobbler Dump cake using this crumble technique and easy canned peaches. Sprinkle your frozen berries with a dry, yellow cake mix. Press the cake mix firmly into the berries, but do not stir. Cut 1/2 cup of butter into small slices. Layer them on top of the cake mix. 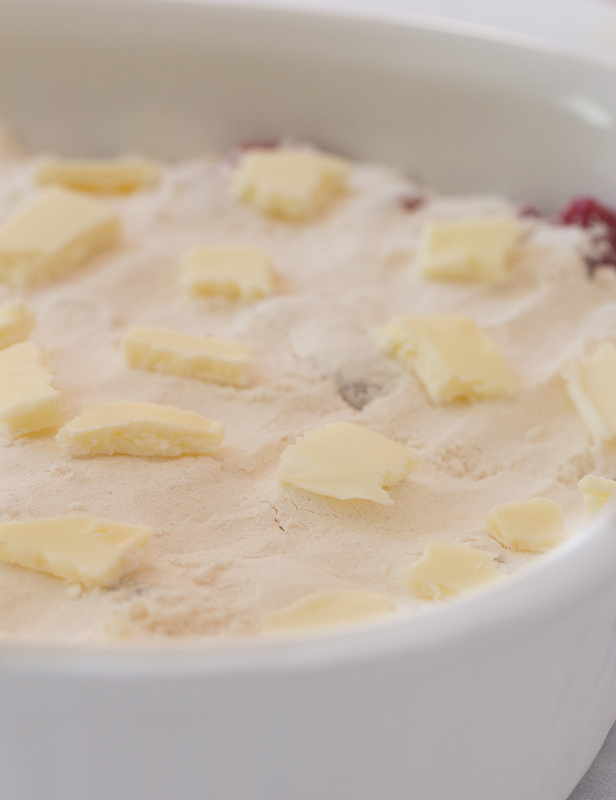 Bake for 45 minutes at 375 for perfect cobbler. We like to top these recipes with a scoop of vanilla ice cream. Let us know how you like them! 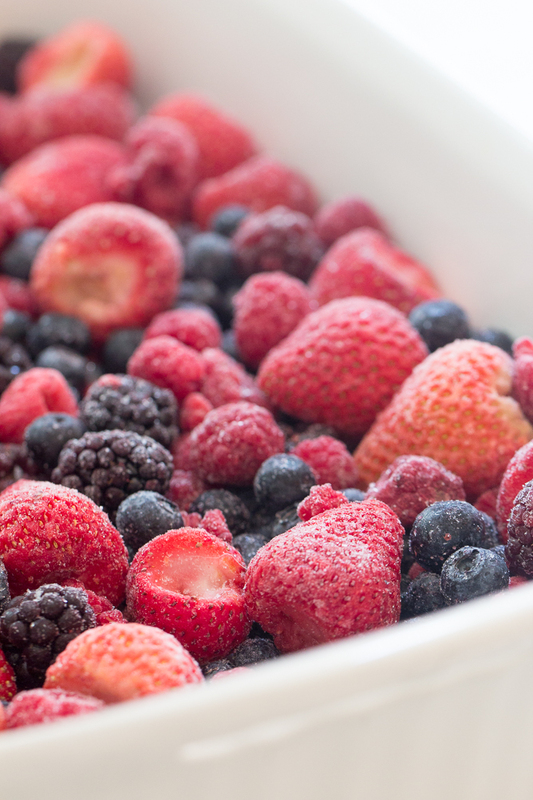 Dump frozen berries into 9x13" pan. Press the cake mix firmly into the berries, making sure they are all covered, but do not stir. Bake for 45 minutes or until cake mix turns golden brown. Serve warm or with a scoop of vanilla ice cream on top. 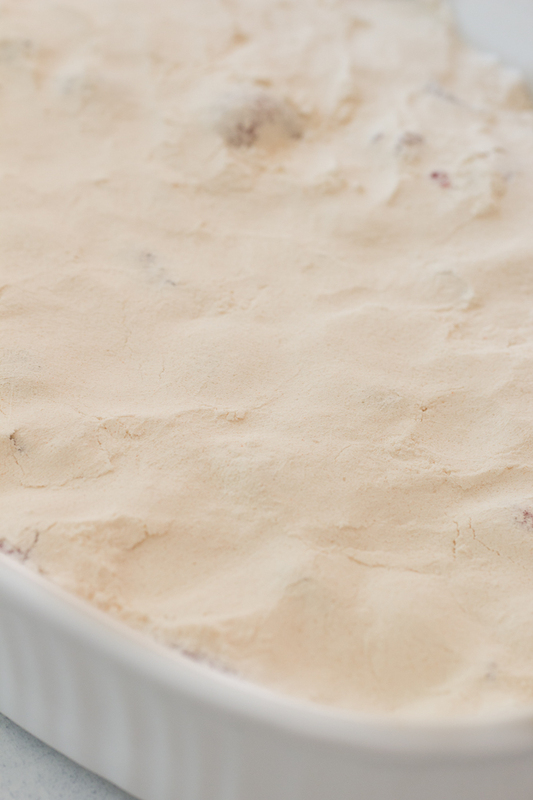 We’re using our easy cobbler topping in this video to make our peach cobbler dump cake! Frozen peaches would work great in this recipe too!